After the genocide of the Jews – and also Gypsies, Poles and other “subhumans” – the motto was “Never again.” Sadly this has happened again and again – in Rwanda, Cambodia, and probably the first televised genocide, the “ethnic cleansing” in Bosnia-Herzegovina and Croatia in the Yugoslav War and the bloody siege of Sarajevo. Today people talk about the Jewish Holocaust in different ways. One of the current ones in the US is to evoke the Nazis’ disarming of the Jews and compare that to possible gun control. That strikes me as incredibly insensitive, and it is also ignorant: Jewish groups have been asking for people to stop proclaiming that this would have stopped the Nazi bloodbath but any perusal of social media turns up memes using Holocaust photos. Another disturbing thing is how casually people talk with anger, vitriol and even hatred of those who oppose their views. Nothing gets done in Congress because the two sides barely speak to each other, and no longer socialize together where families would meet up for picnics, parties, and games. Conservatives and liberals alike malign one another – we live in the richest, most powerful nation the world has ever seen and yet we are incapable of solving our current problems. We have been The City on the Hill – the shining light of morality, ethics, and liberty, envy of the planet. Yet we now see our leaders, our media people, our own president speak viciously about other people who are also made in the image and likeness of Almighty God. What must our Crucified and Risen Savior think of us who claim a Judeo-Christian heritage? When remembering the Holocaust, it is worth remembering how hard it was for German and Austrian Jews to escape: Canada and America both shut the doors in their faces: Anne Frank’s relatives in the US were blocked repeatedly by our government. A Canadian immigration agent said of Jews fleeing Europe: None are too many. This is what happens we deny to ourselves that our political or social opponents are not equally worthy of dignity, when we blithely allow the massacre of unborn babies because they might be “deformed” or have Down’s Syndrome, or aren’t “wanted” by the abusive boyfriend, or because the mother is trapped in grinding poverty and thinks she has no options, we advocate for killing the elderly, the disabled. A culture of death has taken root. The Jews died because too many Europeans and people in the Western Hemisphere were not brave enough to step in, accept them into their nations, protect them – the Nazi propaganda, old stereotypes, and fear combined to let six million men, women, and children die horrible deaths. And what of the Christians trying to flee the Middle East today? Or other refugees: the new limit is 45,000 a year now can come into the United States – how magnanimous! 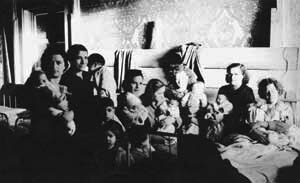 Pius XII’s summer residence as a refuge for Italian and foreign Jews – http://www.spiegel.de/international/world/castel-gandolfo-history-of-the-summer-residence-of-the-pope-a-886181.html — Jewish babies were born in his bedroom. THE WORLD HAS TO REMEMBER!